The lovely, natural scent of leather comes out from the small studio, and the beautiful sunlight glitters from the surfaces of leather bags. Here, in the former tricot factory of Pyynikki, Kaisa Maansalo, the founder of Salmiak Studio, keeps her workroom and storage. The place was a dream coming true to work. Kaisa in front of her studio in Pyynikki, Tampere. Photo by Studio Dettani. 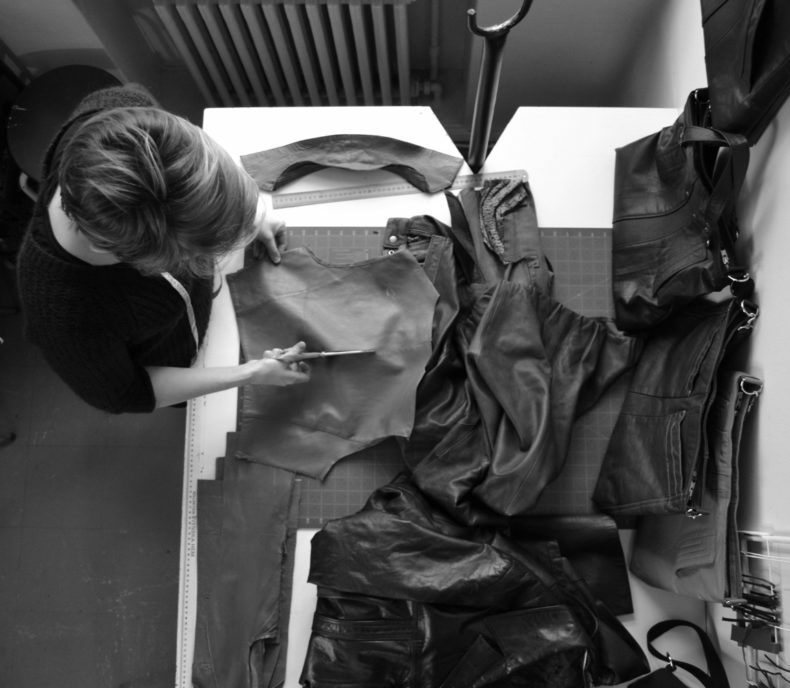 At first, leather was a material Kaisa Maansalo never wanted actually to use. She has been a vegetarian for almost her whole life, and the idea of using the skin of an animal was hideous to her. In 2005, however, her studies required it. Fortunately, her teacher gave her an option to use old leather jackets collected from the Finnish Red Cross. The old leather jackets turned out to be a strong, great, timeless material. The idea of modifying something old to something new and unique was tempting. Nevertheless, for a vegetarian, it took a long time to adapt to the idea of using leather. 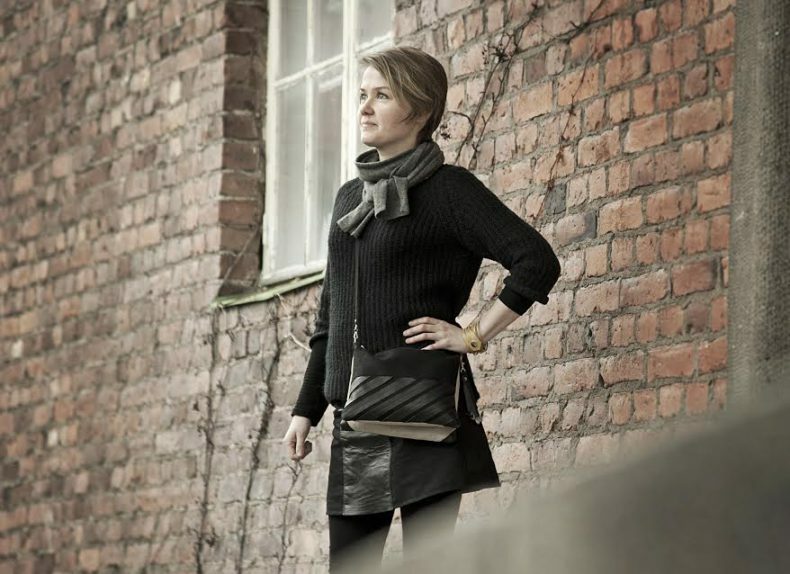 Now, with years of experience and after ten years of studying in the clothing and textile sector, Kaisa is convinced that leather is an ecological option due to its durability. 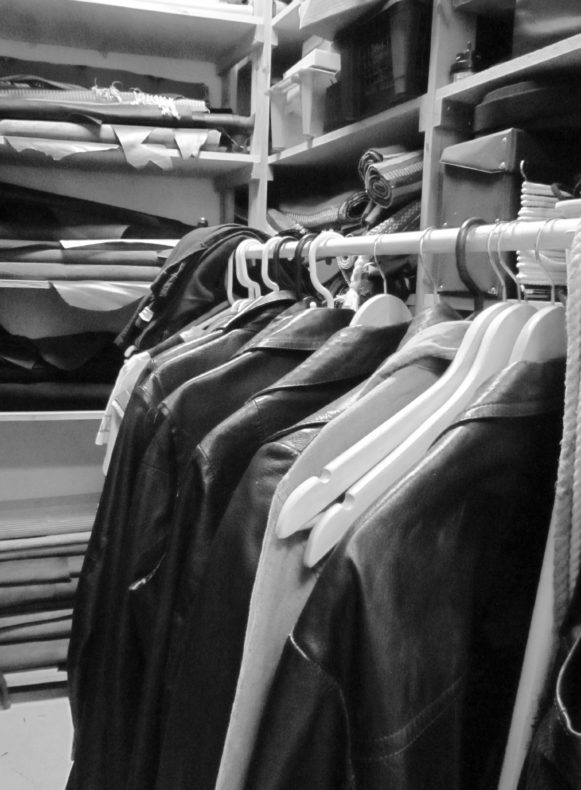 Old leather jackets waiting for a second life as Rotsi bags. Kaisa loves tooling the old leather jackets, each one is a puzzle. 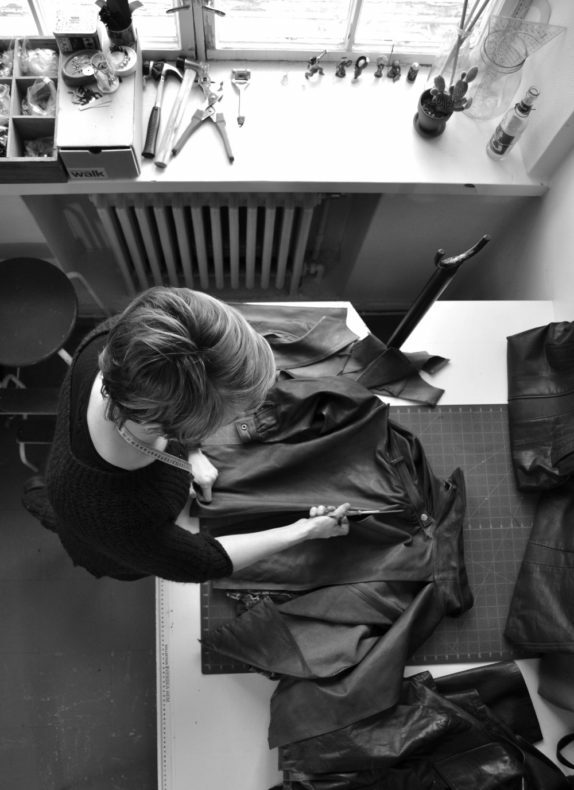 It took some time to Kaisa to learn, which leather jackets are well kept and reusable. Nowadays, the jackets are both bought from flea markets and got from customers. From them, she makes the famous Rotsi bags, in which she has a love-hate relationship. When talking about tooling the flexible leather, Kaisa turns enthusiastic. The more Kaisa modified leather jackets, the more ideas, in which she needed thicker leather, came up. For example, bracelets couldn’t be made from thin leather, and so, Kaisa started to use also the durable surplus and sample pelts from shoe and bag factories. 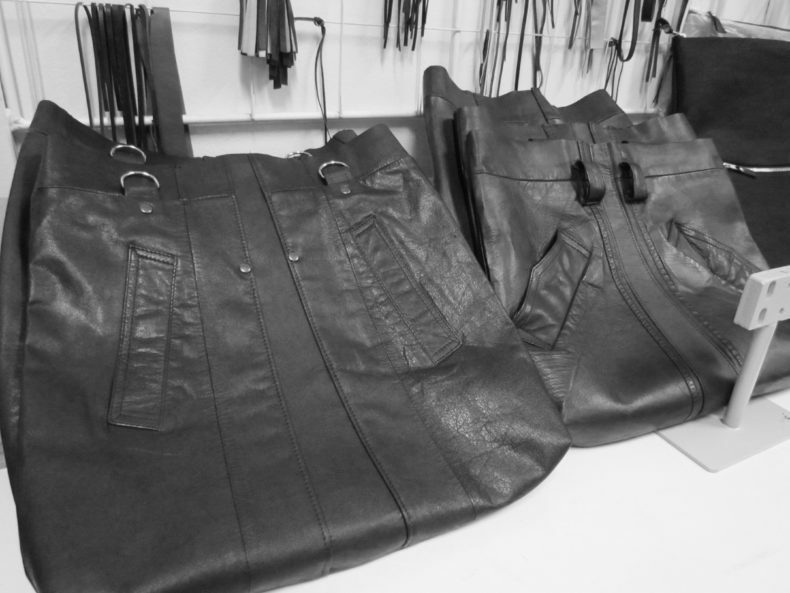 Later on, she chose the thick reindeer leather from Ahlskog’s factory and vegetal tanned cowhide for the bag straps. These choices were clear because Kaisa appreciated domestic production above all. Due to lack of material, the Salmiak bags are unique, and no identical product can be found. Sometimes it’s annoying when an excellent coloured leather pelt runs out. The only leather that keeps coming is the reindeer leather. Kaisa takes out a piece and shows an interesting detail: if the reindeer leather has marks, it’s possible to deduce that the animal has really been outdoors. Kaisa emphasises that leather isn’t the only material in her designs. She has been fascinated and collected wall hangings since 2010. Like the leather jacket, wall hangings are also individuals with beautiful details and sometimes frustrating to work with. The Revontuli bags are a combination of her two favourite materials. In addition, she uses linen, originated from Belgium, in some of her bags. Ethical production was also here a requirement when Kaisa was looking linen manufacturers. She is pleased that linen consumes less water than cotton and that all the fibres are produced, and the manufacturing happens in the EU area. 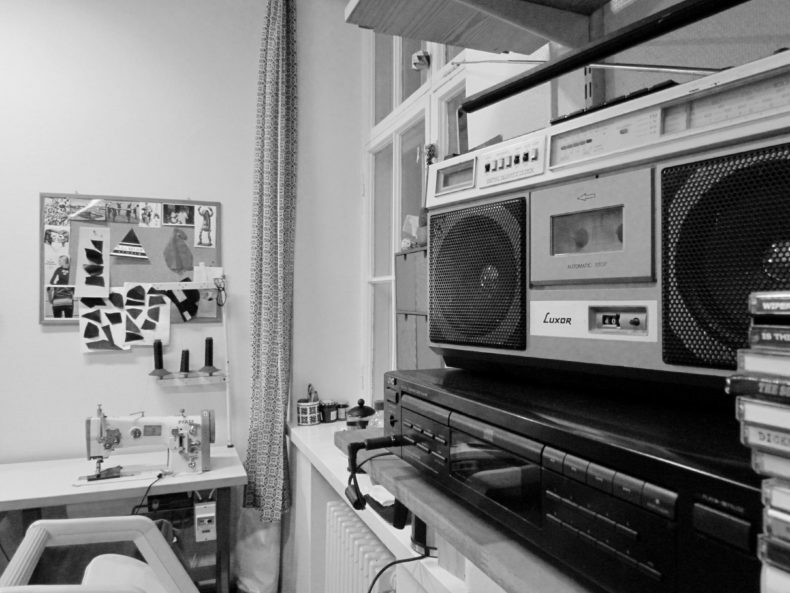 Kaisa enjoys listening music loud and working in the evening. All products by Salmiak Studio are made in Finland. For the first year, Kaisa did everything by herself, but soon she had to start looking for help. 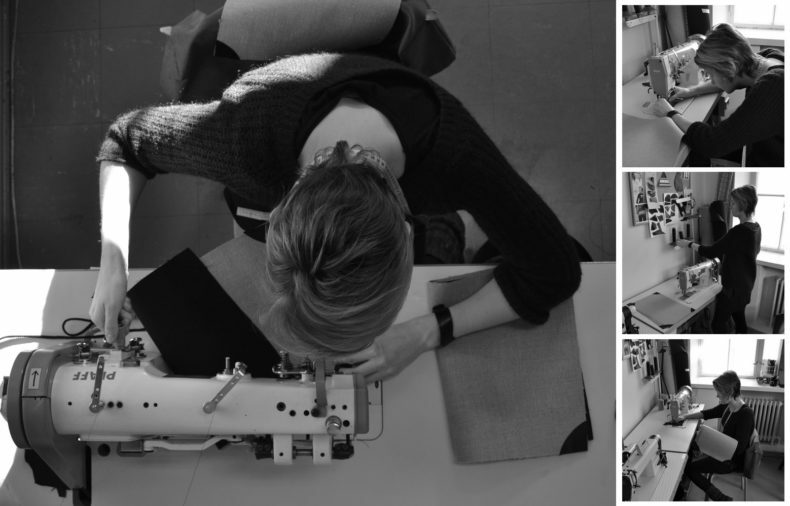 Leather cutting services and seamstresses for the linen bags were quite easy to find from Tampere area. However, there aren’t many who have the machines to sew thick leather. Kaisa doesn’t mind that at the moment, though. She is also keen on cutting the leather jackets and wall hangings herself because the individual products are based on her own vision. “By no doubt, leather is the best material. Not only it is long lasting, but also tooling this interesting material is great!